In my family the “holiday season” may get its kick-off with Thanksgiving, but it certainly doesn't wrap up with Christmas or even New Year's. I come from a big family, and a big family that likes to celebrate! We love the opportunities to get together, especially now that most of us “kids” are married and have families of our own. In our family there are two additional “holidays” during these winter months. One of these is a large party thrown every year for the January birthdays. Three of the six kids in my family have January birthdays and when you add in a nephew and in-laws that have joined the party, January is one big month and makes for one big family get together! The other Clayton bonus holiday is a special day filled with lots of gratitude, love, and celebration and we love to spend it together as a family. Though our family has definitely grown and spread out over the years this day is always celebrated with fondness and as many as can gather, do. So what is this day and why is it so special to our family? On December 30th 1982 my parents were crossing the street when a young driver, without his lights on, came speeding through a red light and changed their lives in an instant. If any of a million circumstances had been different it would have been a fatal accident for either (or both) of my parents or the baby my mom was carrying. She was 8 1/2 months pregnant with my youngest sister when she was hit. I know, you are wondering why on earth we celebrate THIS day, aren't you? Well, a miraculous thing happened from that day and it is the miracles that we celebrate. My dad was unable to return to the job he had, but was able to see the chance to shift and achieve his dream of becoming a Spanish teacher. So many things were different after the accident, but my parents never spoke of them negatively. They were simply a chance to change direction and find better. While there were many trials in those first few years after the accident, my parents always saw it as a blessing. To them it wasn't the day we nearly lost them, it was the day our family got another chance! And so we celebrate. Every year we celebrate them and the second chance we were blessed with. And it is one awesome celebration! We may be strange (I never claimed any differently), but this has become a favorite holiday in our family and every year for as long as I can remember we have had deep traditions regarding New Life's Eve. Certainly one of the best…the menu! New Life's Eve just wouldn't be New Life's Eve without fondue! Since I was a young child fondue has been a symbol of celebration. 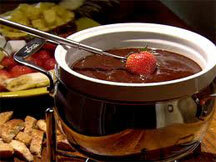 We would all get so excited (and let's be honest, still do) to eat the fondue and it is a fun event. The recipes used have changed over the years and the crowd has certainly changed, but fondue is always there and everybody always loves it! I hope you can forgive my personal ramblings, but my point is that each family has cause for special occasions and they are great opportunities to start traditions, try new things, and have fun together! I am sure you and your family have your own special celebrations and I just wanted to take a minute to share ours with you. Here are some recipes to try next time you celebrate with family, food, and fun. In a large saucepan, bring cider to a boil. Reduce heat to medium-low. Toss the cheeses with cornstarch and pepper; stir into cider. Cook and stir for 3-4 minutes or until cheese is melted. Transfer to a small ceramic fondue pot or slow cooker; keep warm. Serve with bread cubes. Serves 10. 1. Rub the inside of a medium saucepan with the peeled garlic clove. Throw away the garlic. Add the wine and lemon juice and bring to a simmer over medium heat. 2. In a medium bowl, mix the Gruyere and Emmentaler cheese with the cornstarch and toss. Stir the cheese mixture into the wine one small handful at a time. Make sure each handful is completely melted before adding another. The fondue can bubble a bit, but don't let it boil. Season with the nutmeg and pepper. Stir in kirsch (optional). 3. 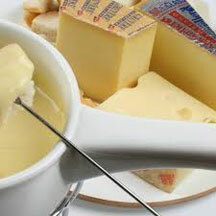 Transfer to a cheese fondue pot and keep warm with burner. Serve right away. In heavy saucepan, over medium heat, melt chocolate chips and butter with EAGLE BRAND® and water. Cook and stir constantly until thickened, about 5 minutes. Remove from heat. Add vanilla. Serve warm as a fruit and cookie/cracker dipping sauce or drizzle over ice cream or cake. Store leftovers covered in refrigerator. Serves 6. 1. In a small saucepan, mix the evaporated milk, sugar, butter and corn syrup. 2. Heat up over medium heat and bring to a boil while stirring. 3. Let the mixture boil and thicken for about 5 minutes. 4. Pour the content into your warm fondue pot. 5. Dip bite size pieces of various dippers using a fondue fork. 6. Enjoy and repeat but no double-dipping!